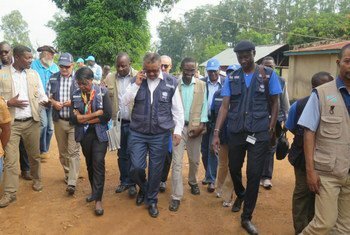 Following a two-day mission in the Democratic Republic of Congo, the Head of the World Health Organization (WHO) on 14 August 2018 repeated his call for warring parties in conflict-riven North Kivu to stop fighting, and allow health teams access to areas affected by the recent Ebola outbreak in the region. WHO-Eugene Kabambi | On 8 August 2018, the vaccination of frontline health care workers started, followed by the vaccination of community contacts and their contacts, in Mangina, North Kivu, the epicenter of the 10th Ebola epidemic to hit the Democratic Republic of the Congo. There are currently 3220 doses of rVSV-ZEBOV Ebola vaccine available in Kinshasa. Speaking at a press briefing in Geneva, WHO Director-General Tedros Adhenom Ghebreyesus, stated that his visit to Beni and Mangina – epicentre of the outbreak which started about a week ago – left him “more worried” than he had been over containing the outbreak on the western side of the country, which officially ended late last month. “What makes the outbreak in Eastern DRC or Northern Kivu more dangerous, is that there is a security challenge. There is active conflict in that area,” he stressed, noting that since January, the area had seen more than 120 violent incidents, including killings and kidnappings of civilians. Referring to the areas where armed groups are operating, he said they could be “hiding places” for the virus. “We have difficulty accessing those areas, and people in those areas will have difficulty moving to places where they can get the support they need,” he explained. “We are asking the international community to help in ensuring access into the inaccessible areas,” Tedros pleaded. “We also call on the warring parties for a cessation of hostilities because the virus is dangerous to all, it doesn’t choose between this group or that group,” he stressed. According to WHO and the Ministry of Health, the number of cases so far stands at 57 confirmed or suspected cases, with 41 deaths, already surpassing the previous Ebola outbreak in the country’s Equateur Province, with 53 cases and 29 deaths. In addition, WHO reports that the number of women infected in Kivu so far is much higher than the number of men infected. In addition to the lack of access, the head of WHO cited several factors that complicate the operational environment for Ebola responders, including the high population density in North Kivu, which was not an issue in Equateur Province; as wells as large-scale population movements within the region and across borders with neighbouring countries which continue. Some one million people have been internally-displaced so far by fighting. Tedros also reported that seven health workers have been infected to date, explaining that this presents additional challenges for the response. Tedros assured that, although all these factors render this outbreak “more difficult to manage,” WHO is continuing to provide support to the Ministry of Health and “doing all we can to be more aggressive than the virus”. Case-finding efforts have led to the identification of over 600 potential virus carriers so far; vaccinations and treatment programmes are underway, and awareness-raising has been stepped up within affected communities, through radio broadcasts and other community-wide communication. In his statement, Dr. Ghebreyesus commended the partnership and joint efforts by the Government of DRC, WHO, the UN stabilization mission in-country (MONUSCO), UN Children’s Fund (UNICEF) and various international non-profit organisations in order to defeat the virus. Thanking donors for their efforts and support in helping defeat the previous outbreak in the Equateur Province, he concluded by calling on the international community to “speed up the financing” to respond to this new crisis. (SOURCE: UN).